Travel to Peru cannot fail to evoke images of a legendary past, as many attractions are associated with the hidden city of Machu Picchu. As attractive as the Incan city may be, however, Peru offers so much more. An imposing landscape that runs from the Andes to the Pacific Ocean, where you will discover a land of indigenous traditions - that have strong roots in fantasy stories and colonial heritage. In an escorted tour to Peru, you can follow the trail of the Incas in the Sacred Valley and in towns with poetic names such as Ollantaytambo, or enjoy the colors of the Pisac Market. You can also explore the Paracas desert and enjoy the fascinating view of the Nazca Lines. Why not head for the Amazon cities of Iquitos or Madre de Dios, where it is easier to see the fauna than on the Brazilian side. Or find the Uros floating islands, artificial islands woven from reeds by the inhabitants of Lake Titicaca. Any vacation package to Peru holds more surprises than you can imagine. Passport with at least six months validity. One page required for stamp. 220V, 60 Hz. U.S. style plug. Check the voltage. Yellow fever vaccination is recommended. We strongly recommend you consult your doctor regarding the possible effects of altitude sickness. 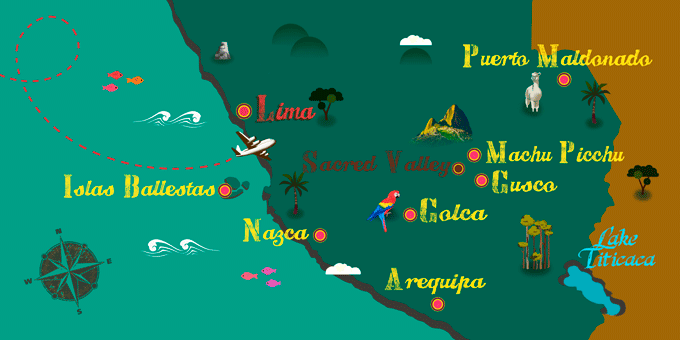 If Peru has caught your attention, leave us your number so we can call you to discuss the voyage that awaits you.